Intelligent Electronics’ Raleigh Showroom has seating, A/V furniture and accessories. Visit today to check our your options! 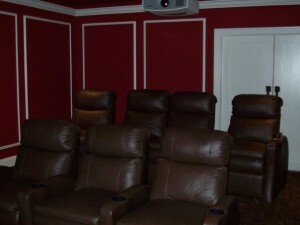 Home theater seating has become the most popular enhancement to the entertainment space. They are even being used in family rooms in place of traditional sofas. Theater chairs come in several styles and covers. Pictures do not do them justice. Theater recliners are very personal. Some people like a firm seat with a soft back and vice-versa. Some like all support while others like to be enveloped in their chair. Even chair size, height from the floor, recline position and arm style can make or break your chair preference. The covers come in hundreds of combinations. You can only closely examine the quality, color and texture in the showroom. Some are glossy and smooth, others textured or matte. Some feel delicate, others durable. The colors never look quite the same from monitor to monitor, much less in person. This doesn’t even begin to cover the optional accessories. Seeing, Touching and Feeling is believing! The only way to be sure you are getting what you really want is to “Sit on It”, literally. Visit our showroom to compare models and styles. Make your selection from a variety of colors and materials such as leather, cloth, micro suede and more. We can show you your options in home theater seats, home theater recliners, home theater sofas, home theater chairs and all the popular accessories like under lighting, drink holders, table trays, and power recline option. Home Theater Audio/Video Furniture is custom designed to meet the size and electronic requirements posed by home theater equipment. It’s important to take certain aspects into consideration, such as proper ventilation to prevent overheating or extended shelf depth to accommodate wires and equipment. Some also provide ports and power strips. Our showroom offers a diverse set of styles for all tastes. 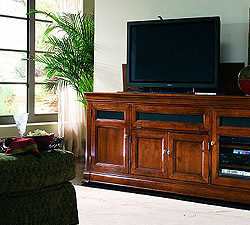 Stop in today to select your ideal home audio video furniture. Accessorizing your theater can be more fun than selecting the equipment. The more you personalize your space, the more you will enjoy it. We can help prioritize your expenditures so you can accessorize without sacrificing the performance of the system and sometimes even enhance it. many samples to audition. Visit Today!